On January 2, 2016, I created a new performance piece in collaboration with the women of the Katakhali Cooperative, on the banks of the Darchira River, which flows into the Bay of Bengal just a few miles down from the village. The work speaks to climate change and the outline of the script was decided after several meetings with the women of the Katakhali Cooperative and my collaborators in Storytelling with Saris. All the women of the cooperative were invited to join, and almost everyone participated. Many of the ideas came directly from the Katakhali women. 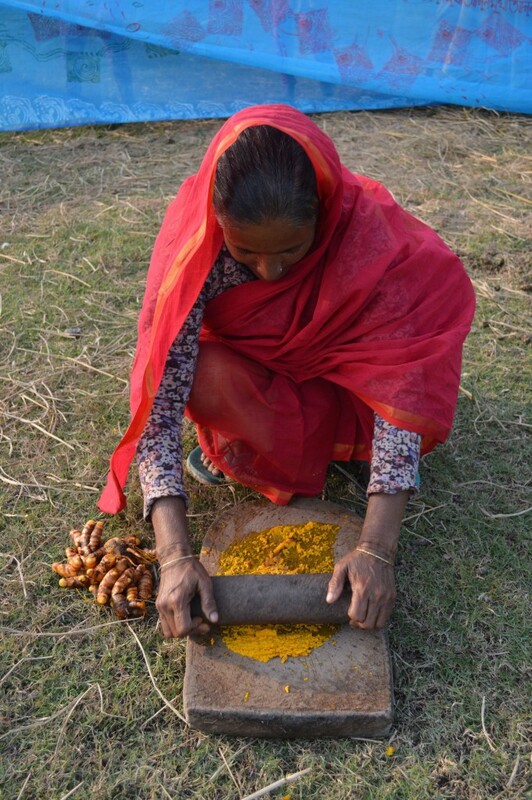 Zakia, one of the members of the Storytelling with Saris project, said that she wanted to grind the fresh turmeric root from her garden and put it on everyone’s face, a ritual that signifies cleansing and new beginnings which is performed as a pre-wedding ceremony. She brought the turmeric to the river bank, ground it up on a shil nora and put it on a banana leaf and anointed everyone with it while singing and dancing. Interestingly, I had also used turmeric in my performance JALOBAYU on Miami Beach, but Zakia spontaneously suggested it on her own. We incorporated another local ritual that involves writing on paper a wish or a problem to solve, putting the paper in water, and then drinking the water. The participants had all been part of a recent workshop on climate change. For the performance, we all wrote about our hopes and goals with regard to climate change and immersed those pieces of paper in the kolshi water vessels we had carried, and later drank the water and used it to wash turmeric paste off our faces. 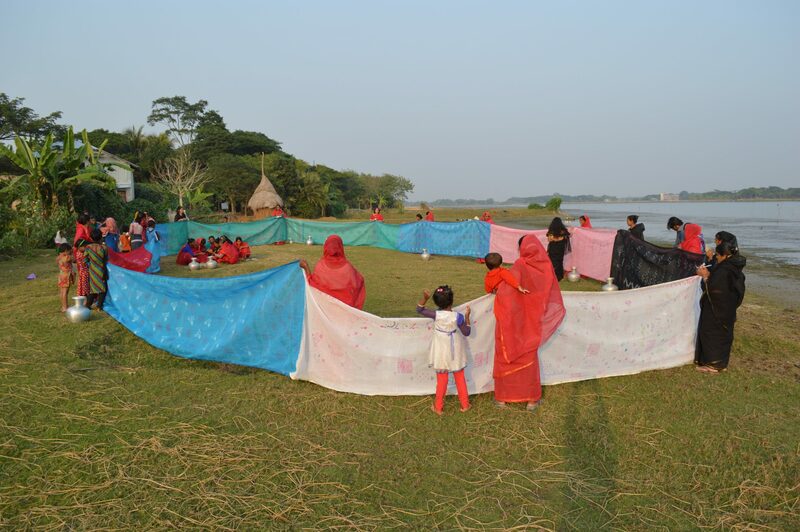 DARCHIRA RIVER also featured a long sari comprised of six new saris with climate themes that were created on December 28, 2016 with eight of the original 12 women of Storytelling with Saris. Stitched together with these saris were three saris covered with climate pledges from Washington, D.C. and Philadelphia. This large sari was carried from the Katakhali Cooperative through the rice fields to the banks of the Darchira River, where it was unfurled and held up next to the river and then made into a circle. 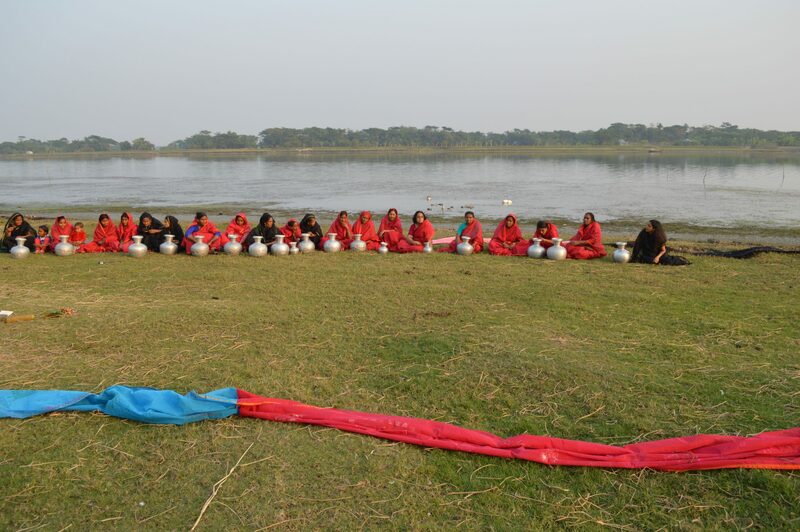 While holding the massive sari, the women sang local oral tradition songs about the river and storms. One woman spontaneously danced. 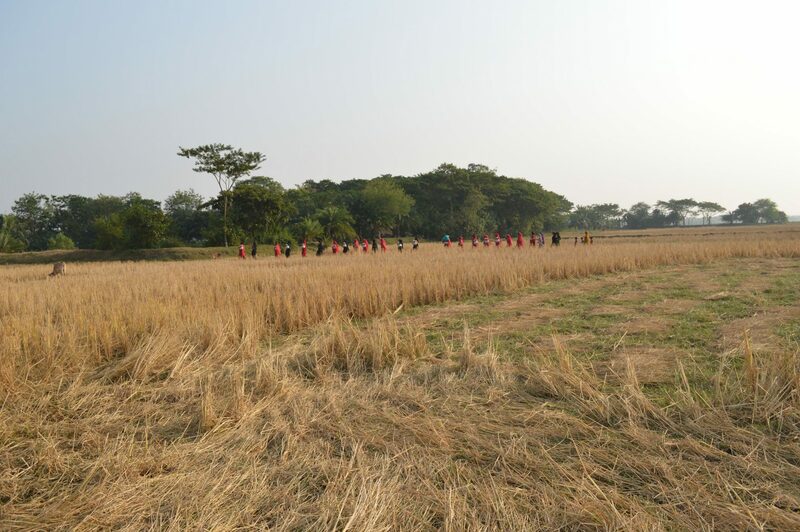 The red and black saris we wore were previously part of the “And Then” installation at the Bangladesh National Museum, which was organized with One Billion Rising Bangladesh in February 2015. 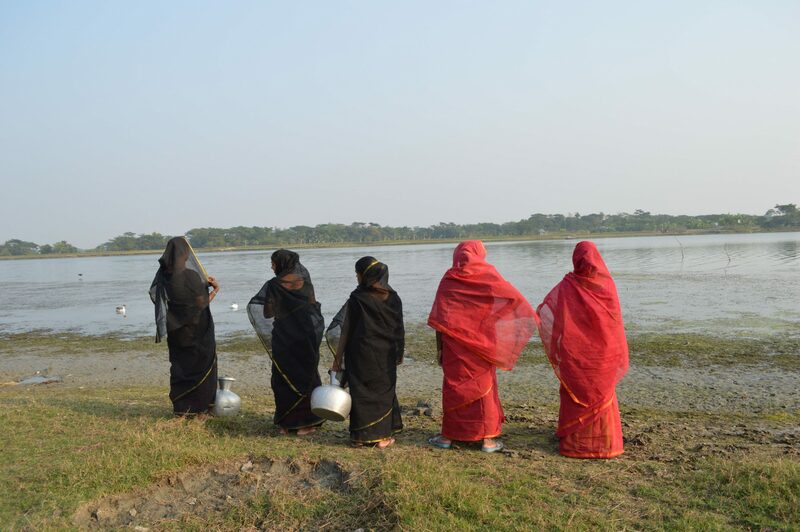 The Katakhali women will now keep the saris and wear them. At the end of the performance, I walked into the Darchira River (which was not planned or discussed in advance). The banks were full of black slippery mud, moss, and plants, and I had to work hard to keep my balance. When I came out of the river, my feet were completely covered in black mud. The other women spontaneously rushed towards me and emptied their water vessels onto my feet to clean the mud off. It was a touching and supportive gesture, emblematic of how people come together to solve problems. I had not planned to do a performance in Katakhali, but in the back of mind I was hoping it might happen. I am so grateful that it was possible have this moment together. Photo credit: Shefali Akhter Shetu, 2016. All images and text copyright © Monica Jahan Bose, 2016.